The road north has become a main way of transportation. 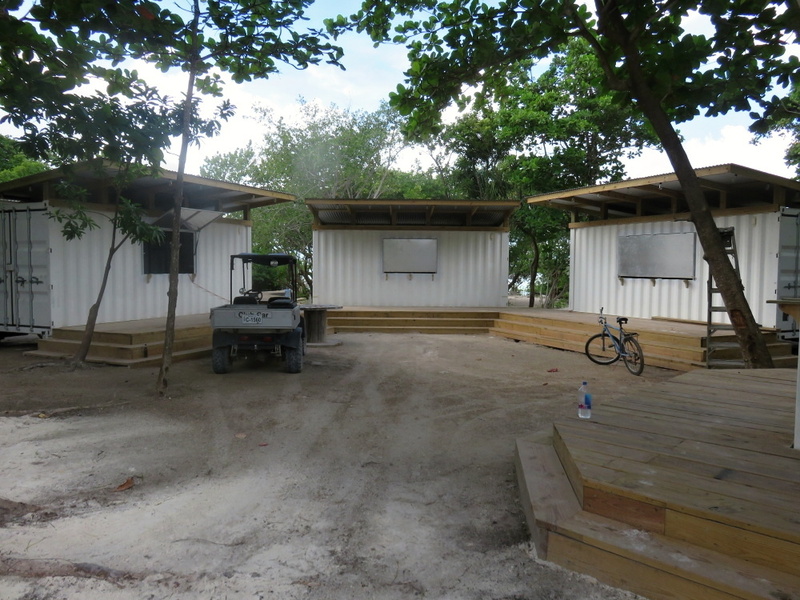 Yes, it was always used by some residents of north Ambergris Caye and as an adventure for tourists headed that way on golf carts…but bring some rains and it turned into a mogulled, muddy slow moving mess. Many took boats or the Coastal Express water taxi to destinations north. Now paved, it’s a thoroughfare…and businesses are starting to pop-up. There is one in particular that I am VERY excited about. The Truck Stop. 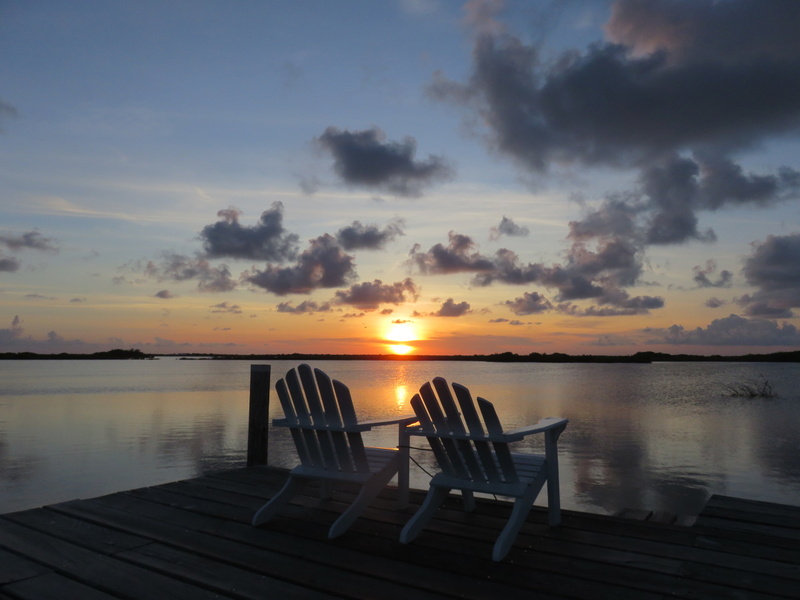 An amazingly clever use of a gorgeous lagoon side property just west of the new road…but then the owners, Ben and Joanna, owners of Island Films as well, have always been pretty clever people. 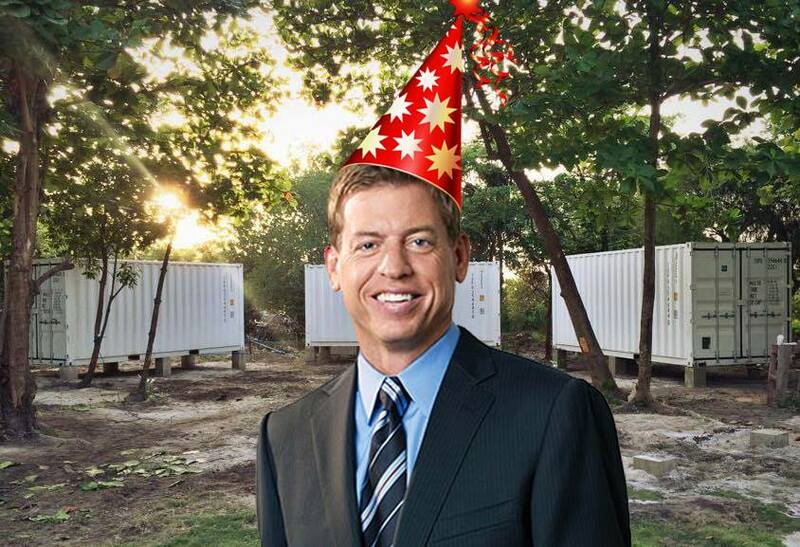 Here was our first look at the project…with an invite to Troy Aikman to celebrate his birthday, November 21st, at the Grand Opening! I don’t know this Troy character but could he have a better offer? Doubtful. Here are some of my pictures. 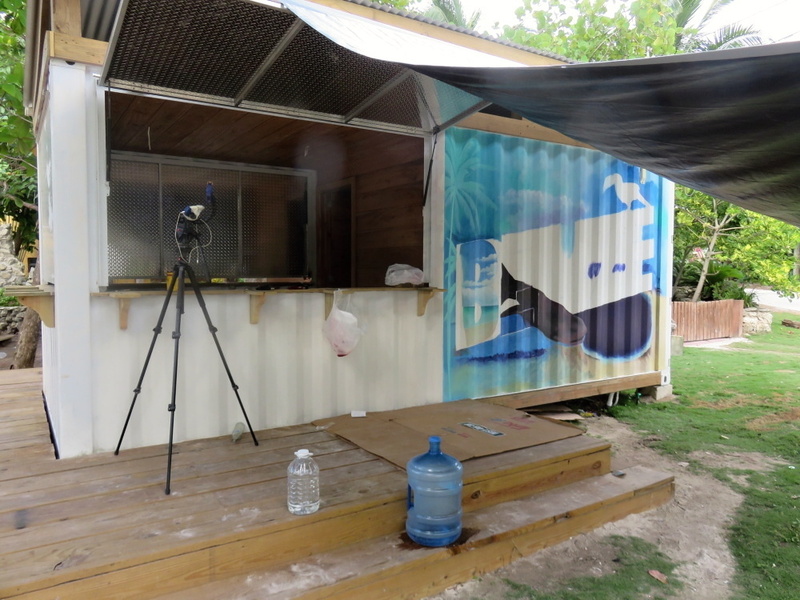 Papo is doing a gorgeous mural on the bar container. All beautifully raised up…there will be seating in the middle with shade. 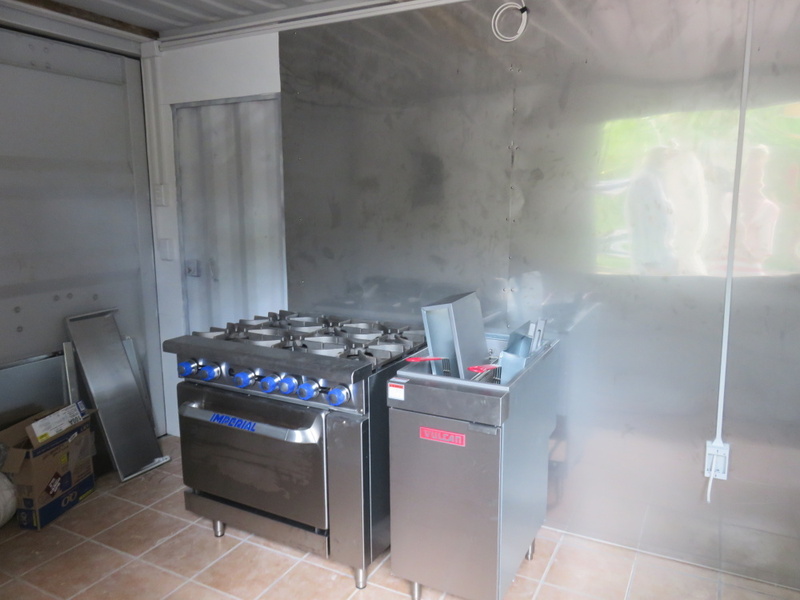 These are no microwave & a hot-pot operations…full kitchens are being installed. 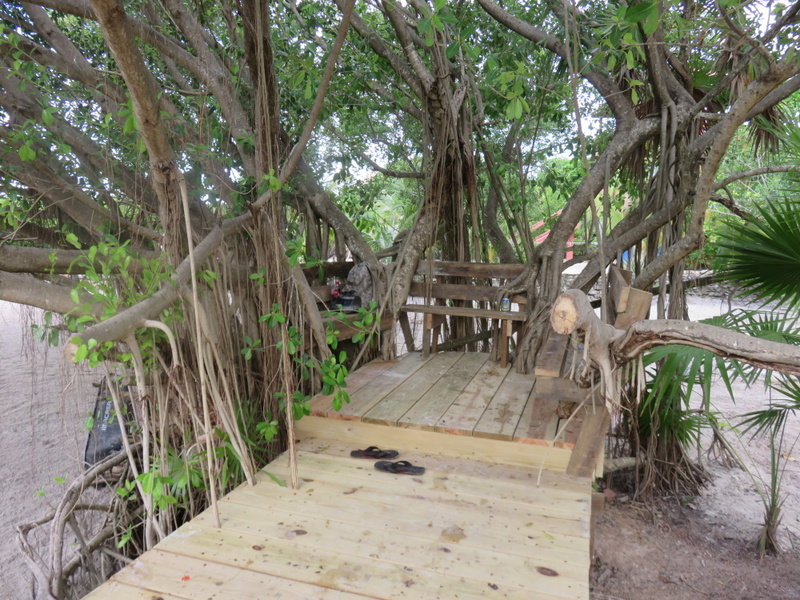 There are restrooms and then this glorious dock to the lagoon. So all the space AND ALL THE SAND THEY HAD BROUGHT IN for games, sports and the fire pit? And this romantic, almost tree-house, Hobbit seat, built within the tree. Think of it…atwinkle with fairy lights. Sigh. With a delicious ice cream sundae in hand…the romance! 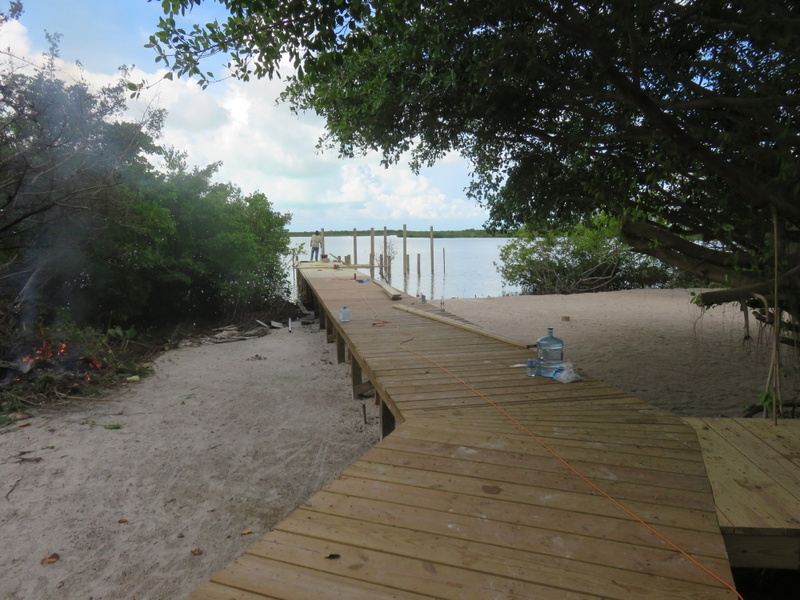 The dock is being built out at a 45 degree angle to maximize sunset exposure. And it will be absolutely beautiful. I mean…if you like seeing this. It’s not for everyone. Truck Stop is located about 1 and a little miles up after the bridge. On the lagoon side off the main road. Just after the turn off to Palapa Bar and before Stella’s Smile. 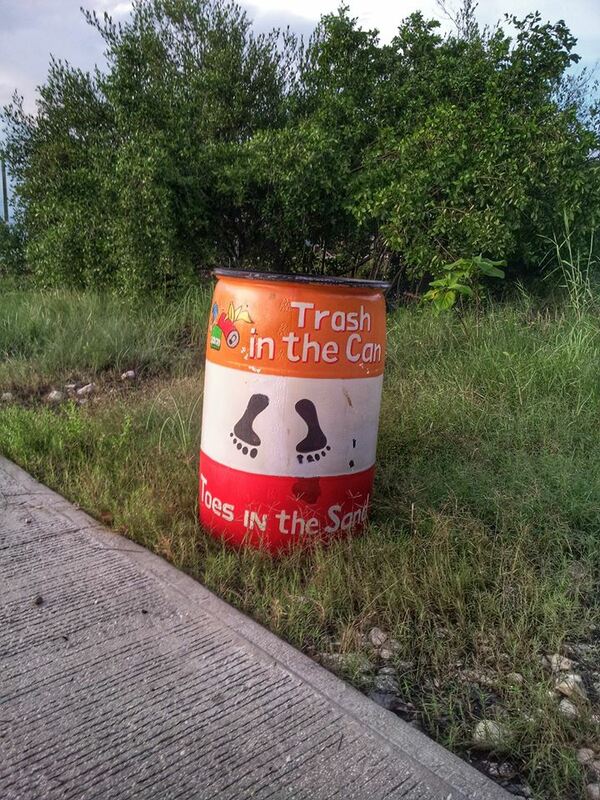 And while you are driving over the bridge and northward to check this out…check out the new trash cans – the hard work of the “First Friday Tres Cocos Trash Clean-Up Crew“. A group SO motivated to keep their neighborhood clean they have provided these barrels. And had a design contest! But the represented their cause for Halloween. 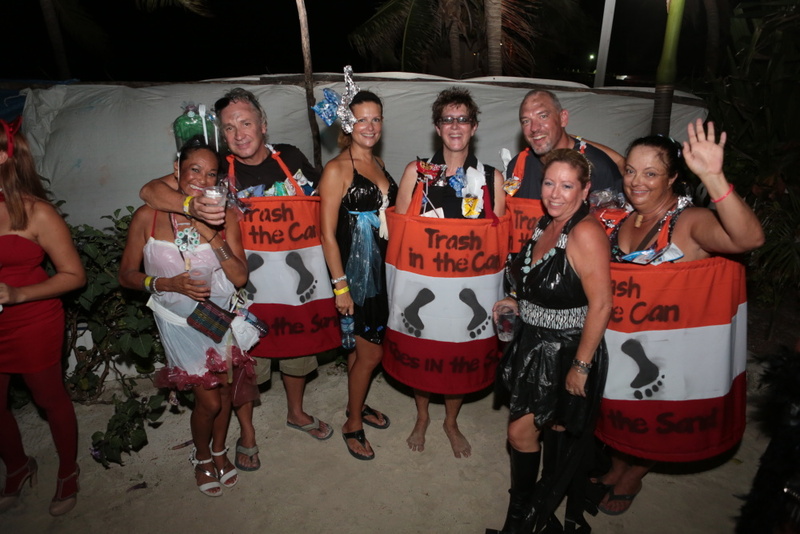 Dressed as trash and trash clean-up. GO CREW! First Friday of every month. THAT’S NOW! Today’s clean-up is from 9am to 11am. And snacks are served. Go Tres Cocos! the “Troy character” is Troy Aikmen, former star quarterback of Dallas Cowboys. No…cuz I was just kidding. Sorta. I probably could name about 5 NFL players – Tom Brady, Joe Namath and…uh…Ronald Reagan? at least you named the BEST one first GO PATS!!!! I think the truck stop will be the coolest thing AC has ever seen, and I hope we get to visit AFTER they open. I am ready! 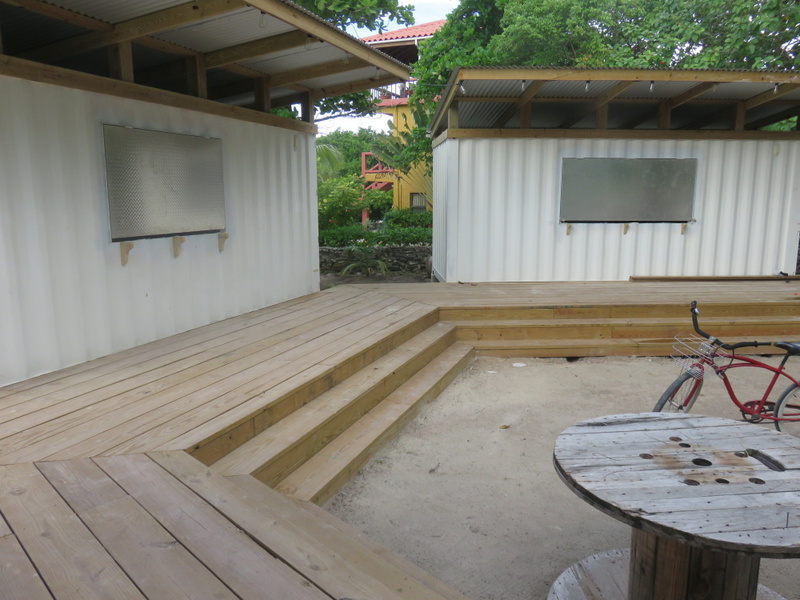 I remember when they were just starting out, the “promised” that the exterior of the containers would be covered (with thatch/would ect) to keep with a Belizean theme. The deck and dock ARE very cool. The painting of the outsides is going to be beautiful! 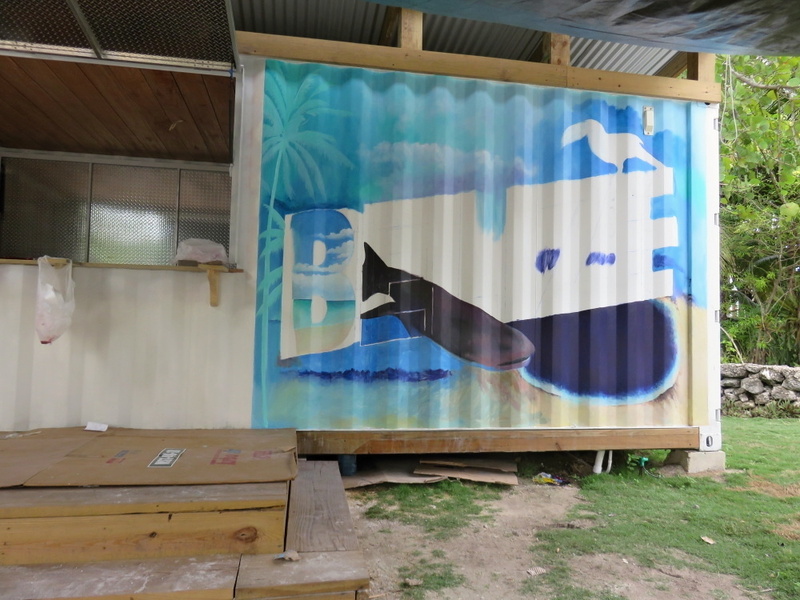 Do you see that super cool BELIZE mural? With the nurse shark? yup. 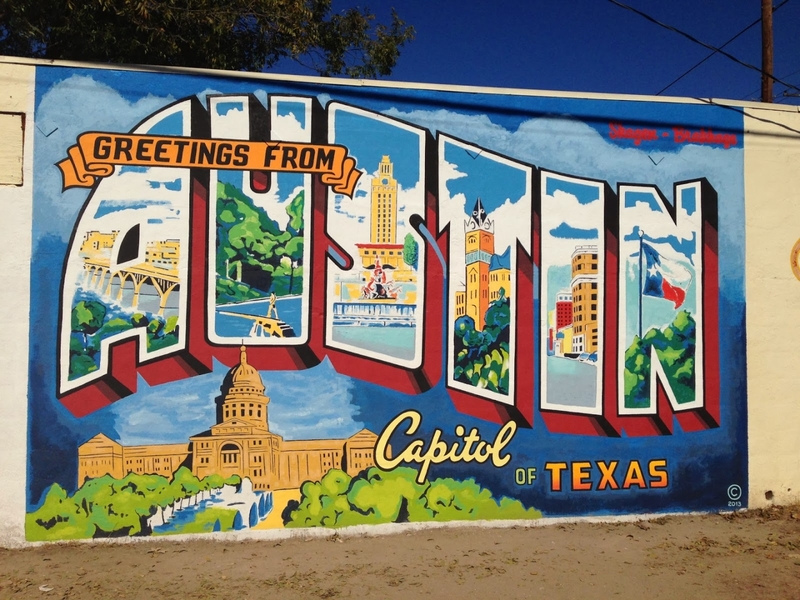 That’s cool, but the Greetings from Austin? (shrug). The location is perfect though. I actually like the industrial look of them! i sure hope it isnt another , damn buisness in tres cocos. 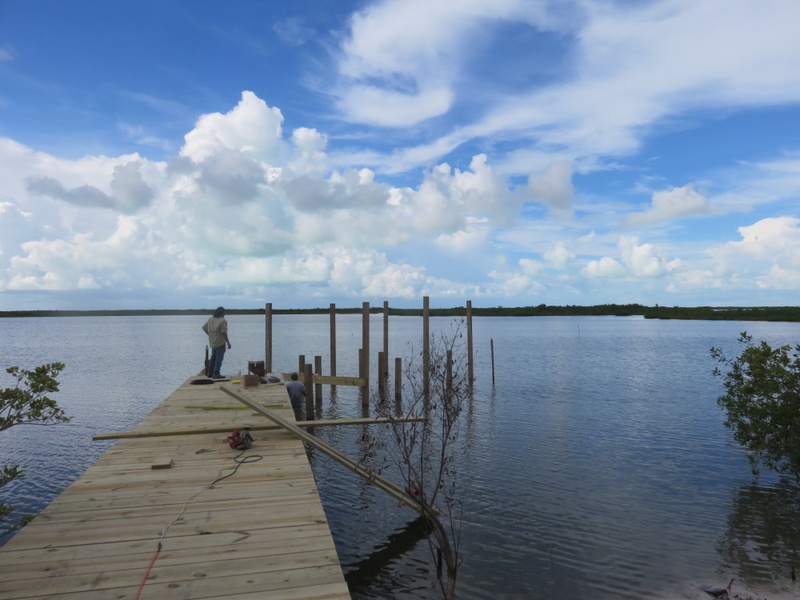 i did like the ,i assume, fact , that they brought in sand ….rather than kill the lagoon by dredging…big-time kudos and thank you ,to the owners,for that . oh and the tree seating… cosy for sure – kool. I like the concept of it. Nice cloud photos off the rear dock, Rebecca. But I don’t understand the Troy Aikman reference though. Just pulling our legs?? ?